This article was first published July 21, 2010. But now a Bloomberg Markets magazine report, “Wachovia’s Drug Habit,” reveals that drug traffickers bought that plane, and perhaps fifty others, “with laundered funds they transferred through two of the biggest banks in the U.S.,” Wachovia and Bank of America. Since 2006, some 22,000 people have been killed in drug-related violence. Thousands more have been wounded, countless others “disappeared,” torture and illegal imprisonment is rampant. In a frightening echo of the Reagan administration’s anti-communist jihad in Central America during the 1980s, the Bush and now, Obama administration has poured fuel on the fire with some $1.4 billion in “War on Drugs” funding under Plan Mérida. Much of that “aid” is destined to purchase military equipment for repressive police, specialized paramilitary units and the Mexican Army. While the Bloomberg story should cast new light on highly-profitable links amongst major financial institutions and narcotrafficking organizations in what may be protected drug rackets green-lighted by corrupt officials, media silence, particularly by outlets such as The Wall Street Journal and theFinancial Times, threaten to propel what should be an international scandal into a one-off news item scheduled for a trip down the memory hole. If, as New York Times columnist Thomas Friedman claims “the hidden hand of the market will never work without a hidden fist,” then perhaps too, drug cartels work their “market magic” with their own “hidden fist” or, as the Russians like to say akrysha, a web of protectors–and facilitators–drawn from business, finance, organized crime and the secret world of intelligence. More curious still, the airline kitted-out its fleet with distinctive colors and a seal “designed to impersonate planes from the U.S. Dept. of Homeland Security.” And when he learned that “SkyWay’s genesis can be traced to In-Q-Tel Inc., a secretive, Arlington, Va., investment group owned, operated, and financed out of the black box budget of the Central Intelligence Agency,” well you can bet corporate media ran themselves ragged investigating that! In fact, as Bloomberg investigative journalist Michael Smith learned years later, these were the same planes and samecurrency exchange which Hopsicker reported back in 2007 traffickers had used to purchase drug jets with funds laundered through Wachovia. In 2008, a Miami federal grand jury indicted Alatorre, now awaiting trial in Mexico along with three other executives, charging them with drug trafficking and money laundering, accusing the company of using “shell firms to launder $720 million through U.S. banks.” The Justice Department is currently seeking Alatorre’s extradition from Mexico. “Troubled Assets” or Something More Sinister? When Wells Fargo bought Wachovia, once America’s fourth largest bank in 2008 at the fire-sale price of $12.8 billion, the bank and its former CEO, Kennedy “Ken” Thompson, who “retired at the request of the board” before the full-extent of the financial meltdown hit home, were in deep trouble. Before the Wells takeover, Wachovia had been on a veritable shopping spree. After the firm’s 2001 merger with First Union Bank, Wachovia merged with the Prudential Securities division of Prudential Financial, Inc., with Wachovia controlling the lion’s share of the firm’s $532.1 billion in assets. This was followed by the bank’s purchase of Metropolitan West Securities, adding a $50 billion portfolio of securities and loans to the bank’s Lending division. In 2004, Wachovia followed-up with the $14.3 billion acquisition of SouthTrust Corporation. Apparently flush with cash and new market clout, Wachovia set it sights on acquiring California-based Golden West Financial. Golden West operated branches under the name World Savings Bank and was the nation’s second largest savings and loan. At the time of the buy-out, Golden West had over $125 billion in assets. For Wachovia however, it was a deal too far. With an enormous housing bubble fully inflated, and a new speculative merger-mania in full swing, one can only surmise that the need for liquidity at any price, had driven banking giants such as Wachovia to play dumb when shadier, yet highly-profitable transactions, such as the “arrangement” with Casa de Cambio Puebla SA, were involved. Bleeding cash faster than you can say “mortgage backed securities,” Wachovia was on the hook for their 2006 $26 billion buy-out of Golden West Financial at the peak of the housing bubble, a move that BusinessWeek reported generated “resistance from his own management team” but ignored by Thompson. Why? “Because no one outside of Thompson and Golden West CEO Herb Sandler seemed to like the deal from the moment it was announced,” a company insider told BusinessWeek. Hammered by the housing bust, Wachovia’s share price, which had risen to $70.51 per share when the Golden West deal was announced had slid to $5.71 per share by October 2008. In other words, Wachovia, along with the world’s economy, began circling the proverbial drain. However you slice it, although it was clear that the Golden West deal had gone south quicker than you can say “credit default swaps,” this didn’t seem to stop Wachovia from paying “smartest guy in the room” Thompson $15.6 million in total compensation in 2007, a year after the fatal Golden West transaction. Nor did these losses stop the bank from showering Thompson with a severance package worth nearly $8 million. Wells Fargo bank admitted in a signed Deferred Prosecution Agreement with the federal government that they would not contest charges brought by the Justice Department in itsindictment of the bank. There was however, more than “troubled assets” and charges of money laundering to the story. In fact, the purchase of these drug planes have been tied to some of the Bush administration’s most secretive “War On Terror” programs. During Iran-Contra it was “guns in, drugs out.” Today one might say its “drugs in, tortured prisoners out.” The results however, were the same; egregious crimes and lawbreaking on a staggering scale. Subsequent investigations by Narco News revealed that “this particular Gulfstream II (tail number N987SA), was used between 2003 and 2005 by the CIA for at least three trips between the U.S. east coast and Guantanamo Bay, home to the infamous ‘terrorist’ prison camp,” Bill Conroy reported. According to AFP, the Mexican daily El Universal said “it had obtained documents from the United States and the European Parliament which ‘show that that plane flew several times to Guantanamo, Cuba, presumably to transfer terrorism suspects,'” the French newswire reported. The plane was carrying “Colombian drugs” bound for the U.S. for the “fugitive leader of Mexico’s Sinaloa cartel, Joaquin ‘Chapo’ Guzman,” when it crashed in the Yucatan. In other words, a jet purchased by drug traffickers with funds laundered through an American bank and used in the CIA’s “extraordinary rendition” program may have been part of aprotected drug operation by U.S. intelligence agencies. An operation furthermore, whose purpose is still unknown. “A recent spectacular example” Scott tells us, drawing on research from his forthcoming book, is the curious case of CIA Venezuelan asset, General Ramon Guillén Davila. General Ramon Guillén Davila, chief of a CIA-created anti-drug unit in Venezuela, was indicted in Miami for smuggling a ton of cocaine into the United States. According to the New York Times, “The CIA, over the objections of the Drug Enforcement Administration, approved the shipment of at least one ton of pure cocaine to Miami International Airport as a way of gathering information about the Colombian drug cartels.” Time magazine reported that a single shipment amounted to 998 pounds, following earlier ones “totaling nearly 2,000 pounds.” Mike Wallace confirmed that “the CIA-national guard undercover operation quickly accumulated this cocaine, over a ton and a half that was smuggled from Colombia into Venezuela.” According to the Wall Street Journal, the total amount of drugs smuggled by Gen. Guillén may have been more than 22 tons. (Fueling America’s War Machine: Deep Politics and the CIA’s Global Drug Connection (in press, due Fall 2010 from Rowman & Littlefield). But the stench of Iran-Contra, like that of the CIA’s torture program, as with earlier secret state machinations with drug cartels never went away; in fact, like a cancer, one managed drug operation seamlessly metastasized into another. The United Nations Office on Drugs and Crime (UNODOC) state in their 2010 Annual Report that “money-laundering is the method by which criminals disguise the illegal origins of their wealth and protect their asset bases in order to avoid suspicion of law enforcement and to prevent leaving a trail of incriminating evidence,” and that financial institutions, particularly U.S. and European banks are key to efforts to choke-off illicit profits from the grisly trade. UNODOC estimate that profits derived from narcotics rackets amount to some $600 billion annually and that up to $1.5 trilliondollars in drug money is laundered through seemingly legitimate enterprises. Part of the fallout from capitalism’s economic meltdown has been that “drugs money worth billions of dollars kept the financial system afloat at the height of the global crisis,” The Observer disclosed late last year. Although the UN’s top anti-narcotics official declined to identify either the countries or banks that have benefited from the murderous trade, a web of corruption envelops the entire financial sector of the capitalist economy as the quest for “liquid assets” trumps everything. 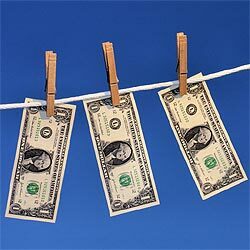 Despite warnings from the Treasury Department since 1996 that Mexican currency exchanges were laundering drug money through U.S. banks, “Wachovia ignored warnings by regulators and police, according to the deferred-prosecution agreement,”Bloomberg reported. Former Scotland Yard investigator Woods, said he “spotted illegible signatures and other suspicious markings on traveler’s checks from Mexican exchange companies,” and that he sent copies of his report to the U.K.’s Financial Services Authority, the DEA and U.S. Treasury Department. Meanwhile, on the American side of the pond, 21-year FBI veteran DeFazio said “he told bank executives in 2005 that the DEA was probing the transfers through Wachovia to buy the planes.” The bank ignored his warnings and continued along on their merry way until their indictment. But Wachovia wasn’t the only large financial institution “missing the point.” Bloomberg also revealed that Bank of America and the London-based “HSBC Holdings Plc, Europe’s biggest bank by assets,” American Express Bank, Banco Santander SA, Citigroup Inc., as well as “the world’s largest money transfer firm,” Western Union were also up to their eyeballs in dubious transactions. Yet between 1999-2004, Bloomberg reported “the bank failed to stop clients from laundering $55 million of narcotics funds, the bank admitted in a deferred-prosecution agreement in August 2007 … and paid $65 million to the U.S. and promised not to break the law again.” Charges were dismissed a year later under terms of the agreement. Bank of America spokeswoman Shirley Norton told Smith that they “strictly follow the government rules.” Norton said, “Bank of America takes its anti-money-laundering responsibilities very seriously,” a fact not readily apparent from Bloomberg Marketsinvestigation.